When you say the words barbecue and grilling do you use them interchangeably? You do know that they aren’t the same thing, don’t you? To be honest, years ago I was guilty of that same mistake. Over the years, I’ve learned the difference between barbecue and grilling and both activities have become a passion of mine. If you tend to use both words to mean the same cooking activity, you most certainly won’t after reading this article. Barbecue means to cook slowly over low, indirect heat. The source of fuel that is used in barbecue is usually charcoal, lump or briquettes, and woods such as hickory, mesquite, and alder. The slow process of barbecue can make even the toughest of meats tender. Have you heard the term falling off the bone? If you have, then it oftentimes refers to meat that has been tenderized through the long, slow cooking process of barbecue. 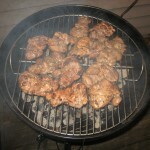 Meats such as ribs, brisket, or whole chickens and turkeys can be barbecued. It may take several hours to complete the barbecuing process but the melt-in-your-mouth results are well worth the wait. The word smoker refers to a barbecue cooking container or vessel which will steadily maintain low temperatures in a smoke-filled environment. The size of a smoker can vary considerably from small table-top models to large, barrel-sized smokers that you can buy or build yourself. One that I use on a regular basis is the Brinkmann Smoke N Grill. It's a great model to use if you are just starting out in the barbecue world. The average temperature maintained while smoking is roughly 225 degrees Fahrenheit. The difference between a grill and a smoker is that the heat source for a smoker is indirect and away from the food and you are also introducing a smoky aroma to the food utilizing various woods. This is the method used to keep the temperatures lower leading to a significantly longer cooking process. You can introduce smoke using various woods while grilling but the process is at a higher heat and a shorter cooking time. Grilling simply means fast cooking over high heat. This is how the average American cooks out on their patio or backyard. Typical grilling items are steaks, hamburgers, hotdogs, sausages, shrimp, fish, scallops, and chicken. You can also grill vegetables that are skewered or you can place them directly on the grill. The cooking time when it comes to grilling typically averages between 5 and 15 minutes depending on what you are cooking. Meats such as chicken legs and pork tenderloin will definitely take a bit longer than a steak or a hamburger but there is simply no comparison in time between grilling and the slow barbecue process. The propane gas grill is king in the world of mainstream grilling from the small table-top, portable versions used at football tailgate parties to the large stainless steel behemoths used in high-end, elaborate outdoor kitchens. The immediacy of an instantaneous flame and heat source has allowed the typical weekend griller to use these grilling devices in any kind of weather. Charcoal grills are also extremely popular and are used for grilling. Even though using charcoal takes a little more time to set up it still remains my favorite. Adding various water-soaked wood chips such as mesquite, hickory, apple, and cherry to the hot charcoal can add a smoky and unique flavor to your food. So, the next time you hear someone refer to barbecue and grilling interchangeably tell them otherwise and educate them! The difference between barbecue and grilling are clear and should be recognized by the average home griller. They are two totally different cooking methods that can yield unique, great tasting results.